After a great two days in Athens and Corinth this morning we boarded our ship, the Olympia. We headed out into the Mediterranean Sea and set course for Mykonos or everyone will have the evening to enjoy and explore the island. We also had Mass on the ship. The homily was marvelous — and you can see/hear the homily here. Enjoy! The past is shrouded in a fog for most people. What was really going on in the 1st century during and after the live of Christ and the birth of the Catholic Church? 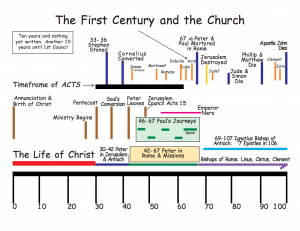 Here is a simple Timeline of First Century Christianity. I created this to give you an overview on one page. I created the Timeline to help my students understand their heritage as Catholics. It shows the key events that took place in the first Christian century. Understand your history! Click here or on the image to right and download and print the PDF file. Free for the using (but not for selling).